Bringing together a wide range of original empirical research from locations and interconnected geographical contexts from Europe, Australasia, Asia, Africa, Central and Latin America, this book sets out a different agenda for mobility - one which emphasizes the enduring connectedness between, and embeddedness within, places during and after the experience of mobility. These issues are examined through the themes of home and family, neighbourhoods and city spaces and allow the reader to engage with migrants' diverse practices which are specifically local, yet spatially global. 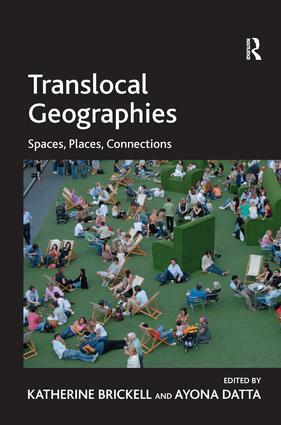 This book breaks new ground by arguing for a spatial understanding of translocality that situates the migrant experience within/across particular 'locales' without confining it to the territorial boundedness of the nation state. It will be of interest to academics and students of social and cultural geography, anthropology and transnational studies. Contents: Part 1 Introduction: Translocal Geographies: Introduction: translocal geographies, Katherine Brickell and Ayone Datta. Part 2 Translocal Spaces; Home and Family: Translocal geographies of 'home' in Siem Reap, Cambodia, Katherine Brickell; Translocal family relations amongst the Lahu in Northern Thailand, Brian A.L. Tan and Brenda S.A. Yeoh; British families moving home: translocal geographies of return migration from Singapore, Madeleine E. Hatfield. Part 3 Translocal Neighbourhoods: Translocal geographies of London: belonging and 'otherness' among Polish migrants after 2004, Ayona Datta; ' You wouldn't know what's in there would you?' Homeliness and 'foreign' signs in Ashfield, Sydney, Amanda Wise; Ways out of crisis in Buenos Aires: translocal landscapes and the activation of mobile resources, Ryan Centner. Part 4 Urban Translocalities: Spaces, Places, Connections: Fear of small distances: home associations in Douala, Dar es Salaam and London, Ben Page; Translocal spatial; geographies: multi-sited encounters of Greek migrants in Athens, Berlin, and New York, Anastasia Christou; Translocality in Washington, DC and Addis Ababa: spaces and linkages of the Ethiopian diaspora in two capital cities, Elizabeth Chacko. Part 5 Epilogue: Translocality; a critical reflection, Michael Peter Smith; Bibliography; Index.